Preheat oven to 160°C (325°F). Place the flour, cocoa, sugar, eggs, milk, vanilla and butter in a large bowl and whisk until well combined. Pour half the cake batter into a lightly greased 20cm-round cake tin lined with non-stick baking paper. Pour the remaining cake batter into a well-greased 2-litre ovenproof bowl. Bake both cakes for 50–60 minutes or until cooked when tested with a skewer. Allow to cool in the vessels for 5 minutes before turning out onto a wire rack to cool completely. To make the chocolate butter icing, place the butter in an electric mixer and beat for 6–8 minutes or until pale and creamy. Scrape down the sides of the bowl, add the icing sugar, cocoa and vanilla and beat for a further 10–15 minutes or until pale and fluffy. Reserve ¼ cup icing to decorate the cake. To assemble the cake, trim the top from the 20cm cake. Place a 15cm-round plate on top of the cake and use a small sharp knife to make a 2½cm-deep cut around the plate. Scoop the cake from the round and reserve. Carefully invert the bowl cake onto a plate and trim the base. Place a 12cm-round plate on top of the cake and use a small sharp knife to make a 2½cm-deep cut around the plate. Scoop 1½ cups of the cake from the round and reserve. Place the 20cm cake on a stand and fill the hollow with the banana lollies. Spread the sides of the cake with ½ cup icing and top with the bowl cake. Spread the cake with the remaining icing. Use your fingertips to crumble the reserved cake crumbs and press into the icing to coat the cake. 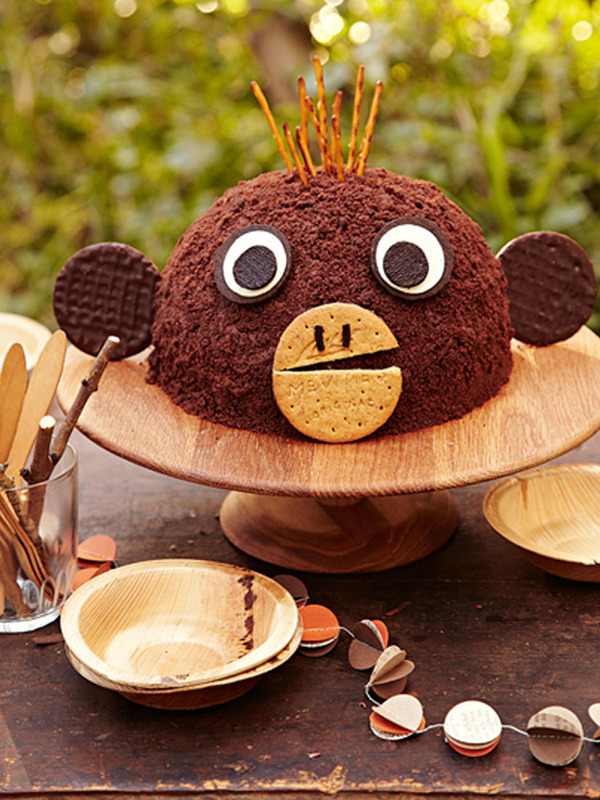 To decorate, push 2 chocolate-coated wheat biscuits into each side of the cake to make the ears. Make a 3cm cut into the third biscuit with a small serrated knife, spread with icing and press, chocolate-side down, onto the front of the cake, using the cut to open the mouth slightly. Spread the licorice strips with icing and press onto the smaller half of the biscuit to make nostrils. Twist to open the chocolate cream-filled biscuits, ensuring all the filling stays on one biscuit. Spread a little icing on the back of each cream-filled biscuit and press onto the front of the cake to make the whites of the eyes. Twist open the mini chocolate and cream-filled biscuits, ensuring all the filling stays on one biscuit. Spread the biscuits without filling with icing and press onto the eyes. Break the pretzels in half and insert into the top of the cake to make the hair. Serves 12–16.